The new home-theater-in-a-box package includes a complete 5.1 system. 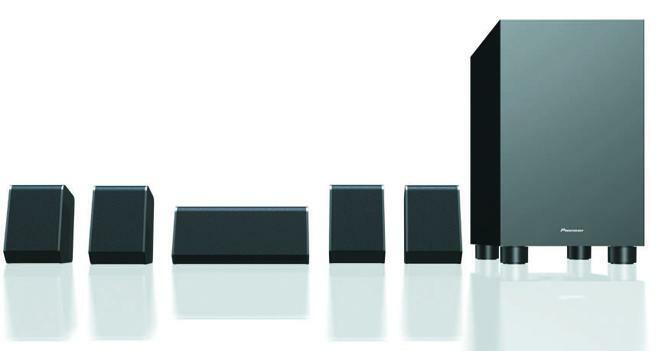 Pioneer has announced the launch of its new HTP-076 Home Theater Package. Designed to offer an affordable entry-level surround sound solution, the package features a 5.1-channel AV receiver, speakers, and a subwoofer. "Setting up a home theater can be a confusing and intimidating process with many consumers not knowing where to start," said Don Milks, Director of Marketing & Product Localization for Onkyo & Pioneer USA. "Our complete home theater package is an ideal, all-in-one starting point for folks who want to enjoy a tremendous home theater experience without breaking the bank." The HTP-076 package includes a Pioneer VSX-326 5.1-channel AV receiver rated for 80 W/ch (8 ohms, 20 Hz-20 kHz, 0.08 % THD, 2ch Driven FTC). Under the hood, the receiver features a Digital Quad-Core 32-bit DSP (Cirrus Logic) and 384 kHz/32-bit D/A Conversion with AK4438 (AKM). Video pass-through with 4K (60p/4:4:4/24-bit), HDR10, HLG, Dolby Vision, Wide Color Gamut (BT.2020), and HDCP 2.2 compatibility is integrated as well. In addition to the receiver, the package also includes two front bookshelf speakers, a center bookshelf speaker, two surround bookshelf speakers, and a subwoofer -- offering a complete 5.1 surround sound configuration. And though the system does not include upfiring or height speakers, the receiver is capable of simulating overhead audio using Dolby Atmos Height Virtualizer or DTS Virtual:X technology. 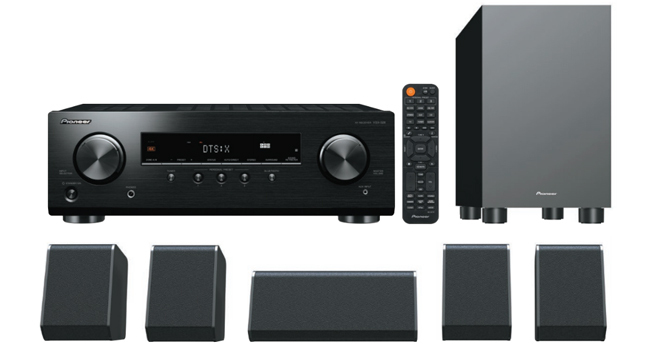 Likewise, the receiver is also capable of supporting a true 3.1.2 Dolby Atmos or DTS:X audio setup through the addition of upfiring or ceiling speakers (sold separately). The Pioneer HTP-076 Home Theater Package will be available soon for an MSRP of $499.